Proteins and Enzymes Products | BioVision, Inc. The demand for proteins for research purposes is significantly increasing over years. They are the central machinery in all cells and organisms and form one of the most sought after diagnostic targets. Proteins are available in native or recombinant versions for these purposes. These proteins act as important tools for scientists in studying biological mechanisms and discovering cell function. BioVision is proud to offer a fleet of native and recombinant proteins from numerous sources including plasma, bacterial cells, insect cells, mammalian cells, yeast, human cells and even animal free origin. We also house numerous Animal free origin (AFO) recombinant proteins and enzymes. Each of these sources offers some advantages over the other. Our native proteins are isolated from plasma and are tested for potential contaminants. However, due to limited availability of biological material, these proteins are available in small sizes. Our recombinant proteins portfolio encompasses a very wide ranging array of products including, cytokines, growth factors, enzymes, lipoproteins, compliment proteins, etc. Most of these proteins are ≥ 95% pure, endotoxin tested and have been validated for activity. •	From multiple sources including human, mouse, rat, rabbit, bovine, etc. •	Tested for activity and purity. •	Available in flexible sizes. •	Controls for Western blotting, ELISA, etc. 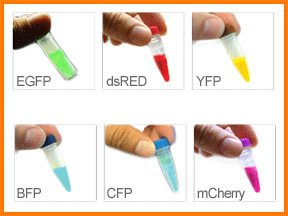 Fluorescent Proteins : BioVision offers the brightest Green / Red / Blue / Cyan / Yellow / mCherry fluorescence proteins that expressed from E. Coli. These recombinant proteins were purified using a proprietary technology that ensures highest purity and fluorescence intensity. These proteins are very useful in gene expression studies, use as standards for SDS-PAGE, Western blot analysis, fluorometer and flow cytometer calibration, fluorescence microscopy, and microinjection into cells and tissues, etc. Cytokines, Growth Factors and Hormones : We offer an extensive portfolio in this category. The products in this category are standardized for reproducibility and consistency and are designed for applications such as cell culture, differentiation studies and functional assays, relevant in numerous biological fields like immunology, neurology and stem cell research. All these proteins can be used for basic and pre-clinical research. These cytokines are also complimented very well by assay kits for the same targets. 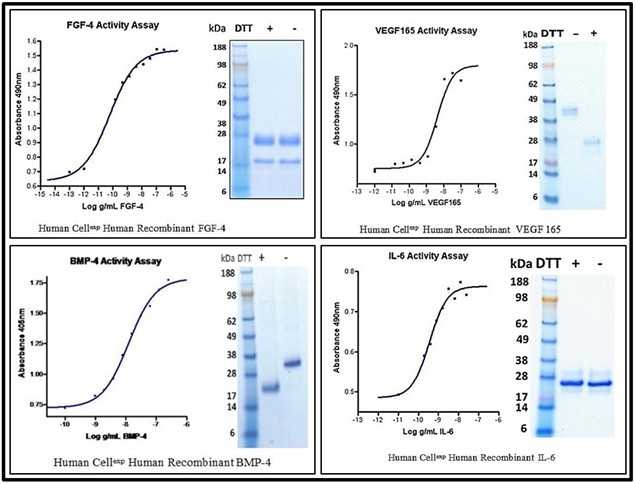 Protein A/G/L & Affinity Conjugates & Related Products : BioVision offers a wide range of Agarose, Sepharose & Magnetic beads coupled to Protein A, Protein G, Protein L, Protein A/G, Protein A/G/L or Jacalin to purify monoclonal and polyclonal antibodies from culture media, serum, ascites fluid or hybridoma supernatants and to isolate antibody/antigen complexes in immunoprecipitation experiments. These resins are available in several convenient pack sizes and can be regenerated and reused multiple times when stored properly. The USP of these conjugates are enhanced specificity, high binding capacity, high flow rate and minimal leaching of the ligand. •	They contain all the post-translational modifications (which affects the activity, function and half-life) seen in human proteins, which are not present in proteins expressed in alternate sources. •	They mimic native human proteins in terms of sub-unit assembly, folding, secretion and other processes. •	They show the same chemical & biological properties like stability, isoelectric point, solubility, binding affinities and biological activity. •	They are produced in serum free medium; hence they exhibit minimal batch to batch variability and are pathogen free products. Please explore our complete product line in this category to find proteins for all your research needs.